Ever wanted to run your own ebook business? eBook website, preinstalled with 50 eBooks! 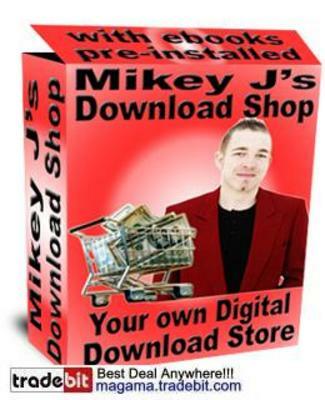 Your own instant digital download business! Preinstalled with 50 ebooks and software! Fully automated! Make money while you sleep! Easy to run! No programming knowledge required! All you need to start your own ebook business! Download Shop is the best and easiest to use out-of-the-box eBook store turnkey webscript on the market, designed for ease of use for both the owner and customers. It's an instant business! You can start selling as soon as youve installed the website! The website is totally automated and customers get instant access to their downloads straight after they make their purchase. This website script does it all for you, 24 hours a day! What makes this website really cool is the fact that it comes fully stocked and ready to do business with 50 preinstalled downloads, including ebooks, reports and software. Google AdSense is built in, so you can earn revenue through Google's advertising programme. Simply enter your Google AdSense ID into the Admin and you're away! Comes pre-installed with 50 bestselling digital products to get you started. The purchase can only be downloaded once, so the customer can't pass the download link around to friends. Text and colours and are completely customizable. Editable prefilled Terms And Conditions and Privacy pages. Choosing The Right Web Host by Mikey J. If you are new to web hosting or are confused by all the technical jargon that web hosting companies spew out, then this informative e-manual will help you understand all the confusing factors around choosing the right web host for you. The eBook also explains how to accept credit cards online, how to register a domain name, plus much more! Simple Guide To FTP by Mikey J. This helpful e-manual is an excellent guide to using an FTP programme and provides lots of hints, tips, step-by-step instructions and screenshots to help you upload files to your web server. An excellent resource for those of you who are new to uploading website scripts. To operate this website, you will need UNIX/Linux web hosting with PHP 4 or 5. It is RECOMMENDED that your web server has a CPanel Control Panel with PHPMyAdmin and My SQL database. It is NOT guaranteed to work properly on web hosting that DOESN'T have CPanel. To install this website, you should have a basic knowledge of file uploading. This product comes with FREE MASTER RESELL RIGHTS! You are allowed to sell copies of this product to your customers and keep ALL the money you make from it! You will also receive a readymade HTML sales page to use on eBay or on your website to resell this product! With Master Resell Rights, you can ALSO give resell rights to your buyers!